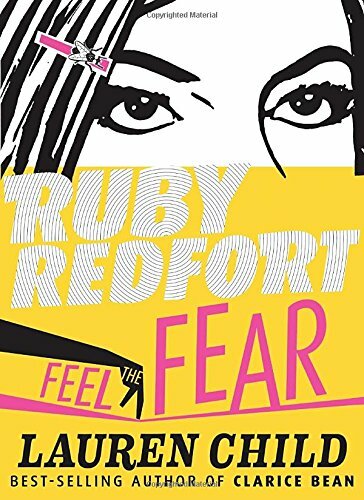 At times a little silly, this exciting new installment in the Ruby Redfort series will hold the attention of fifth graders and older by keeping them guessing until the end. The reader will be breaking codes right along with Ruby and possibly even trying out the martial arts described. Thirteen-year-old Ruby is such a natural code breaker that she works for a super-secret organization dedicated to protecting the world. As is the case with most teenage secret agents, the badddies have no problem finding her and complicating her life. Set in fictional Twinford – resembling a cross between New York City and Los Angeles – the story follows the celebration of a film star’s career and of the release of her once-lost movie. All the while, people in high rise apartments report break-ins through impossibly high and small windows. Apparently, little of note is missing after the break-ins. When a seemingly blank business card is discovered at one of the scenes, Ruby is on the case. Of course, Ruby is constantly in trouble at work, with her parents, and with her loyal friend. Eventually, Ruby finds a connection between the film star and the break-ins. Meanwhile, she helps her friend solve a problem and foils the baddies. The length of the book is daunting, but there’s a lot going on here, making it well worth the read.